How will NASA's James Webb Space Telescope shed the heat generated by its science instruments and their supporting electronics? To anyone who is not an engineer or scientist, the answer might be complex and "baffling," and it turns out the process is exactly that. Webb's four science instruments are held within a support structure called the integrated science instrument module (ISIM), located behind the telescope's primary mirror. The ISIM and Webb's optics form the science payload of the observatory. To keep heat away from the sensitive instruments, a majority of the electronics used to power and operate the instruments are housed in a compartment below ISIM, where specially designed baffles direct the heat safely into space and away from any cold surfaces of the observatory. The baffles essentially act as mirrors to reflect the heat (infrared radiation) outward in a specific direction. 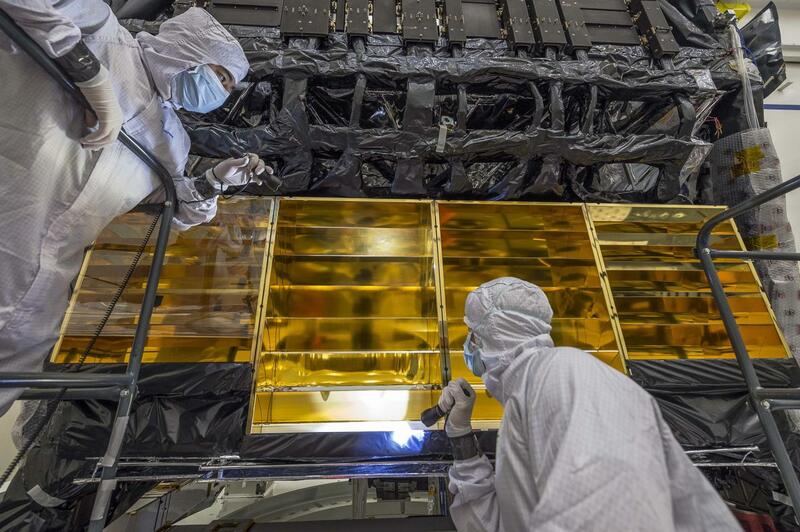 If that sounds familiar, it is because Webb's mirrors will do very much the same thing — but instead of reflecting the infrared light into space, they will guide it with pinpoint accuracy to the telescope's science instruments. "Gold has a very high reflectivity in the infrared spectrum range, so it is ideal for directing heat," explained Matthew Stephens, a mechanical systems engineer for Webb at NASA's Goddard Space Flight Center in Greenbelt, Md. "This is the same reason all of the primary, secondary, and tertiary mirrors are gold-coated." The engineers had to reinstall the baffles before Webb's science payload and its spacecraft element (the combined spacecraft bus and sunshield) are integrated at Northrop Grumman Aerospace Systems in Redondo Beach, California, where both halves of the observatory currently reside. If the engineers wait until after integration, Webb's tennis-court-sized sunshield will obstruct the ISIM electronics compartment and make reinstalling the baffles much more difficult. NASA's James Webb Space Telescope will be the world's next great space science observatory. Webb will solve mysteries of our solar system, look beyond to distant worlds around other stars, and probe the mysterious structures and origins of our universe and our place in it. Webb is an international project led by NASA with its partners, the European Space Agency (ESA) and the Canadian Space Agency (CSA).